• Despite a global slowdown, India’s economy is expected to grow 7% to 7.5% for the year ending in March, just above the 6.9% rate recorded the year before he took office. • Foreign direct investment from October 2014 through June 2015 increased 40% compared with the same period a year earlier, thanks to his “Make in India” program, which eliminated or reduced restrictions on foreign investment in many manufacturing sectors. • Foreign exchange reserves now top $350 billion, India’s highest level ever. “A lot of confidence and hope continues to be built around India,” Finance Minister Arun Jaitley said Monday, as he outlined a $288 billion spending program for the fiscal year ending March 2017. Nevertheless, long-awaited moves to loosen restrictions on land acquisition and a tax overhaul sought by corporations to boost business have yet to materialize. That’s because opposition parties that control the upper house have blocked his boldest policies, thwarting the strong majority his party holds in the lower house of parliament. Eliminating the red tape also has proved daunting. India jumped 12 places on the World Bank’s ease of doing business index during Modi’s first year in office — from 142 to 130 — but many complex regulations and paperwork requirements have not been reduced. Corporate leaders also note that a lack of skilled workers in India prevent Modi’s “Make in India” program from becoming reality. 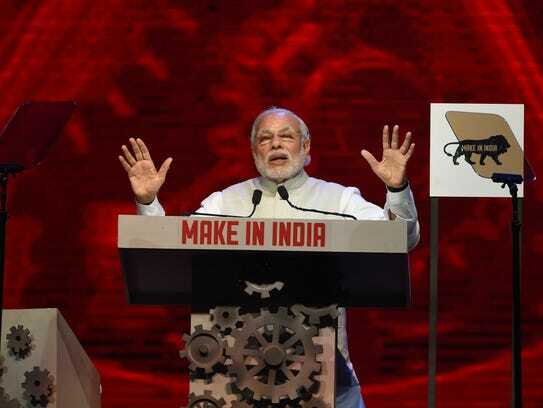 “Some low scale manufacturing may move to India. But if you want to build Brand India, you have to first build global Indian brands,” Anand Mahindra, chairman of the Mahindra group, which makes cars, farm equipment and other products, told India Today newspaper. Other business leaders praise Modi’s accomplishments in a country where making any major change in how things are done is exceedingly difficult. Binod Agarwal, CEO of a small auto-parts manufacturer, New Engineering Works, cites an increase in government services available online, and says his company has seen a 30% to 40% increase in sales since 2014. Government “has become more efficient and more transparent, and less dependent on government officials,” Agarwal said.